Short Fuse is a battle minigame found in Mario Party DS. 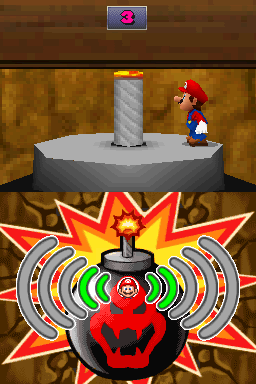 A Bowser bomb falls, and the players must put out the fuse, blowing into the microphone for three seconds. The players take turns blowing out the fuse, and whoever sets off the bomb is knocked away and kicked out of the minigame, and the game continues. Last player standing wins. The way to win this is to not blow the fuse a lot if it is almost out. Since this minigame has a timer that is set for shorter than five seconds, the timer is red as soon as the minigame begins. Rules – "All players take turns blowing on the bomb fuse, hoping to make the bomb blow up for the next player. If you're caught in a blast, you're out!" Tips – "You must blow on the bomb at least a little, or else the bomb blow up anyway! So blow just a little, even if the fuse is very short!" French Mèche rebelle Play on the expression Mèche rebelle, a strand of hair that always stands up, and the other meaning of Mèche, fuse. This page was last edited on October 6, 2018, at 17:22.